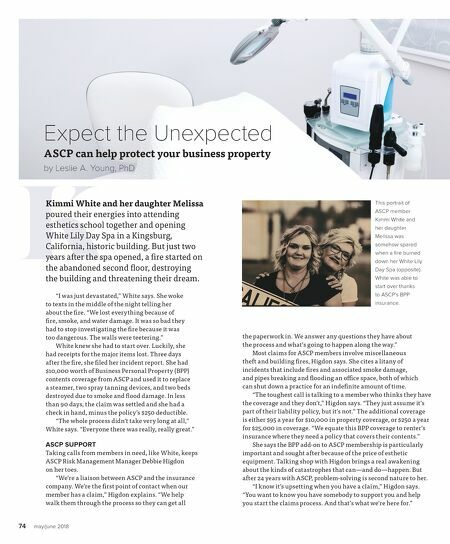 74 may/june 2018 K Expect the Unexpected ASCP can help protect your business property by Leslie A. Young, PhD Kimmi White and her daughter Melissa poured their energies into attending esthetics school together and opening White Lily Day Spa in a Kingsburg, California, historic building. But just two years after the spa opened, a fire started on the abandoned second floor, destroying the building and threatening their dream. "I was just devastated," White says. She woke to texts in the middle of the night telling her about the fi re. "We lost everything because of fi re, smoke, and water damage. It was so bad they had to stop investigating the fi re because it was too dangerous. The walls were teetering." White knew she had to start over. Luckily, she had receipts for the major items lost. Three days after the fi re, she fi led her incident report. 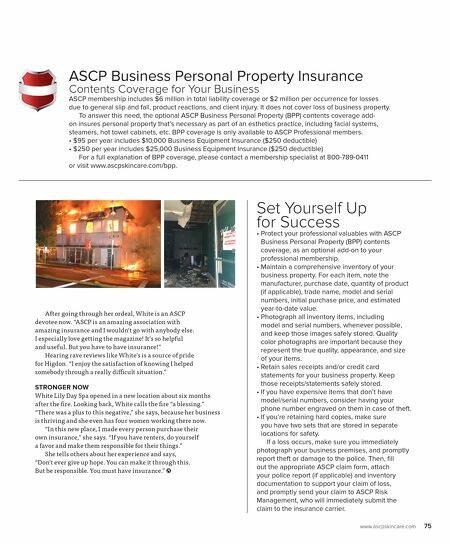 She had $10,000 worth of Business Personal Property (BPP) contents coverage from ASCP and used it to replace a steamer, two spray tanning devices, and two beds destroyed due to smoke and fl ood damage. In less than 90 days, the claim was settled and she had a check in hand, minus the policy's $250 deductible. "The whole process didn't take very long at all," White says. "Everyone there was really, really great." ASCP SUPPORT Taking calls from members in need, like White, keeps ASCP Risk Management Manager Debbie Higdon on her toes. "We're a liaison between ASCP and the insurance company. We're the fi rst point of contact when our member has a claim," Higdon explains. "We help walk them through the process so they can get all the paperwork in. We answer any questions they have about the process and what's going to happen along the way." Most claims for ASCP members involve miscellaneous theft and building fi res, Higdon says. She cites a litany of incidents that include fi res and associated smoke damage, and pipes breaking and fl ooding an offi ce space, both of which can shut down a practice for an indefi nite amount of time. "The toughest call is talking to a member who thinks they have the coverage and they don't," Higdon says. "They just assume it's part of their liability policy, but it's not." The additional coverage is either $95 a year for $10,000 in property coverage, or $250 a year for $25,000 in coverage. "We equate this BPP coverage to renter's insurance where they need a policy that covers their contents." She says the BPP add-on to ASCP membership is particularly important and sought after because of the price of esthetic equipment. Talking shop with Higdon brings a real awakening about the kinds of catastrophes that can—and do—happen. But after 24 years with ASCP, problem-solving is second nature to her. "I know it's upsetting when you have a claim," Higdon says. "You want to know you have somebody to support you and help you start the claims process. And that's what we're here for." This portrait of ASCP member Kimmi White and her daughter Melissa was somehow spared when a fi re burned down her White Lily Day Spa (opposite). White was able to start over thanks to ASCP's BPP insurance.